Can someone ID this strange fruit for me please? – Rare Fruit Society of South Australia Inc.
Q: Can someone ID this strange fruit for me please? A: It is an Osage orange (Maclura pomifera (RAF.) Schneid.) and is not to be confused with true oranges, which are members of the Rutaceae. 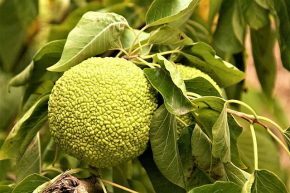 The Osage orange is in the Mulberry or Fig family, namely the Mor­aceae. 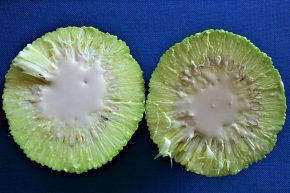 The Osage orange fruit is not good for eating as it is full of acrid milky juice and small brown seeds.